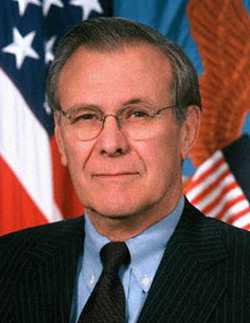 Donald Rumsfeld was both the youngest and oldest Secretary of Defense in American history. He was the youngest when, at age 43, he took charge of the Pentagon under President Gerald Ford in 1975. Appointed to the same post by President George W. Bush more than 25 years later, he became the first Secretary of Defense in his 70s. He was also a Congressman from Illinois in the 1960s, and all-Navy wrestling champion during his military years. Between his two stints at the Pentagon, he was chief executive of pharmaceutical giant G D Searle & Company from 1976 to 1985. He sold off several Searle subsidiaries, reduced the payroll by more than half, and made Fortune's list of the ten toughest bosses in America. Critics charge that he used his Washington connections to rush approval of Searle's aspartame (NutraSweet), which, by the time Rumsfeld left, accounted for more than half of Searle's profits. He later served as CEO at General Instrument Corporation, a high-tech manufacturer that was eventually bought out by Motorola. Even while in the private sector, though, Rumsfeld remained a deep inside advisor for Republican administrations and high-level office-holders and candidates. He visited Saddam Hussein's Iraq in 1983 and 1984 as a special envoy representing President Reagan, shortly after the infamous incident when Hussein gassed the Kurds. When these visits became newsworthy decades later, Rumsfeld said he had "cautioned" Saddam to stop using chemical weapons. Transcripts of the meetings, however, include no mention of this topic. Despite his long-time status as a stalwart Republican, Rumsfeld made campaign contributions to at least two Democratic candidates for office, Bill Bradley and John Glenn. He also led a commission in the 1990s, at President Clinton's request, to determine whether the national missile defense system (aka "Star Wars") was feasible (they decided it was). As Secretary of Defense in the Bush administration, Rumsfeld oversaw two wars against tiny nations which were essentially unable to mount any serious defense. He is one-for-two: Rumsfeld's plans were effective in toppling Afghanistan quickly with few American casualties, and installing a U.S.-friendly government there. But in Iraq, the reasons Rumsfeld cited for attacking have been disproved, so it remains unclear what vital American interest U.S. soldiers are fighting for. And while Rumsfeld's strategy allowed U.S. forces to quickly take nominal control of the land, no-one has yet found a way to calm the increasingly angry natives who want the Americans to leave their country. The flow of dead and injured Americans -- and Iraqis -- continues. In press conferences, Rumsfeld enjoyed mocking reporters whose questions he deemed silly. Often, though, his own answers were so meandering and muddled, it seemed Rumsfeld might be on medication, entering senility, or simply avoiding the questions. Some pundits jokingly recited the transcripts of Rumsfeld's answers as goofy poetry. He was in the Pentagon on September 11, and helped load the wounded onto stretchers. When the Abu Ghraib torture scandal was making headlines, Rumsfeld offered his resignation to President Bush, twice, and twice Bush refused it. Critics charged that the torture was systematic, not merely the work of out-of-control low-level grunts. Pulitzer prize-winning reporter Seymour Hersh has reported that memos from Rumsfeld "encouraged physical coercion and sexual humiliation of Iraqi prisoners". New York Times columnist Maureen Dowd once quoted Henry Kissinger as calling Rumsfeld the most ruthless man he knew, all global despots included. Kissinger says he never said this. "We do know that the Iraqi regime has chemical and biological weapons. His regime has amassed large, clandestine stockpiles of chemical weapons -- including VX, sarin, cyclosarin and mustard gas." "We know where they [Iraq's weapons of mass destruction] are. They're in the area around Tikrit and Baghdad and east, west, south and north somewhat." "[W]e never believed that we'd just tumble over weapons of mass destruction in that country." Member of the Board of Tribune Co.